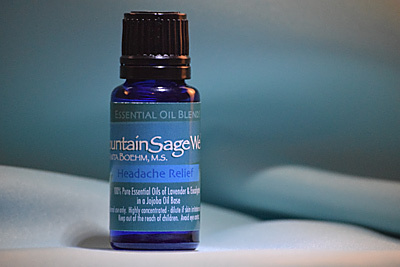 This formula is effective in relieving pain from headaches including migraines. Lavender 100% pure essential oil is known, medicinally, to relieve pain of migraine and tension headaches in addition to balancing extremes of emotion. Eucalyptus 100% pure essential oil contributes to emotional equilibrium and aids in reducing the pain of headaches – including migraines. It is also antiseptic and decongestant; helps to fight and prevent colds, flu, throat infections, sinusitis, and headaches caused by such ailments. Also, great for relieves breathlessness caused from bronchitis and asthma. Suggested Use: This blend may used daily using any of the following methods. Place a drop under nose or onto specific points (i.e., acupressure points, trigger points, etc.) for additional therapeutic effects. At the initial onset of headaches, massage this oil you’re your temples and around areas where the headache is most prominent. It is also helpful to place drops on the occipital bone area on the back of the head. Feel free to contact Mountain Sage Wellness for additional suggestions. Use in an aroma diffuser (just a few drops in water) for therapeutic inhalation effects. Add a few drops to a bath, vaporizer, compresses, etc. or add additional base oil for massage. Essential oils are also great for enhancing any mindful practice including: meditation, yoga, and Qigong. Therapeutic effects of essential oils are vast and vary for each oil (i.e., emotional balancing, muscular, circulatory, respiratory, etc.). Do not use if pregnant. If skin irritation occurs, add more base oil (i.e., jojoba oil) or discontinue use. Avoid eye contact, swallowing, and contact to open wounds.